At the heart of Haven, Colgate’s survivor-centric support center for sexual violence, is a survivor herself. Tracia Banuelos, a graduate of Wichita State University, who majored in psychology and women’s studies, said her experience of being assaulted at a young age, and the resulting difficulty in finding services herself, ultimately led to a career path where she is responsible for something she always felt was lacking in her journey as a survivor. Support. Just nine months into her tenure leading programs at Haven, Banuelos has already earned a staff excellence award. Her office in Haven, nestled within the satellite health clinic in Curtis Hall, is designed to be a welcoming space for students, while also providing privacy to visitors. It takes only a moment of talking with the vivacious Banuelos to get an understanding of her dedication to student health and wellbeing. Her office walls are covered with large sheets of paper completely filled with marker scrawls of new ideas, concepts, and thoughts about how Haven can further assist those in need. “I came in here, and we just started doing. That’s my motto. The two things I’m most proud of so far — I wanted an ambassador program, and I wanted a special graduation ceremony for survivors. Those things are happening,” Banuelos said. The ambassador program has 14 students and one peer educator who have taken a five-week PE course taught by Banuelos, titled Sexual Assault and Action. The concept is simple, and it’s effective, Banuelos said. Because survey data show that more than 90 percent of sexual assault survivors tell a friend even if they don’t officially report the incident, ambassadors can help introduce their peers to the support options on campus. I came in here, and we just started doing. That’s my motto. Banuelos’s other major initiative to come to fruition is the creation of a special graduation ceremony for survivors, which will be the first of its kind at Colgate. She said the ceremony is designed to recognize the challenges those students have faced and to celebrate perseverance in the face of adversity. Banuelos played an integral role in a recent panel, titled “A Community Responds: Faculty, Staff, and Students Talk about Sexual Assault at Colgate,” along with other staff, faculty, and students. “Tracia’s passion for the work is clear, and she finds ways to bridge with others to improve Colgate and make this a better place for everybody especially survivors,” said Dawn LaFrance, director of counseling and psychological services and director of sexual violence support. 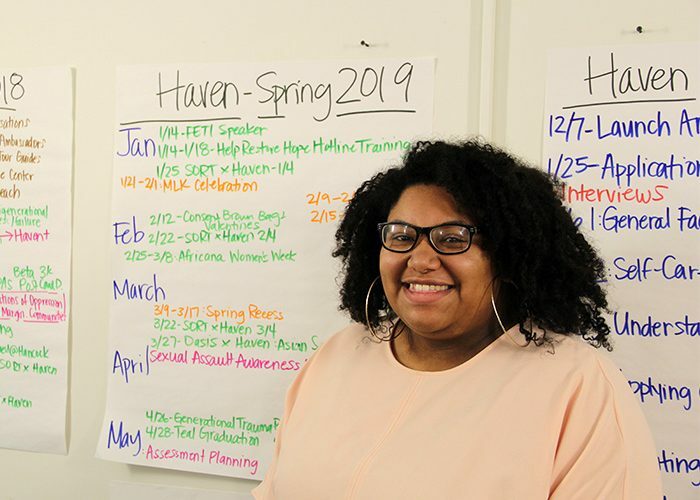 The team at Haven is also working to create new resources for survivors, especially since many of the options currently available on a national level are heteronormative and in the binary, Banuelos said. Haven is sponsoring a number of special events for Sexual Assault Awareness Month.